quality and service can''t be faulted however my only complaint is waist sizes stop at 44 when they could be made upto a 48 inch waist i had to move buttons across result not very comfortable so unwearable but my waistline is not the fault of wpg! lol but i think an increase in their waist sizes would not go unrewarded. I like these better for fit than the midwar trousers. Waist size is accurate. I bought a size 40 and the legs were already cuffed perfectly for me with about a 32" inseam with an inch of extra material to let out if need be. I had to add a button/button hole at the top of the fly at the belt line as it seems to need one there. The button holes for the fly should be farther away from the edge of the cloth as their position allows the buttons to show as they are so close to the edge of the flap that covers them. I had to resew all the buttons as they were barely sewn on. As I don't have any spares, I can't afford to lose any. Jerry should have them throw a few extras in the pockets or otherwise sew them on somewhere inside.... There seems to be two colours of KD that Jerry sells. These pants are the tanner of the two shades. Mine do not match the officers KD SD which is the more orange coloured khaki. Otherwise the quality is excellent. 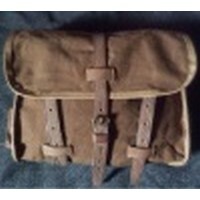 British early WWII pattern Khaki Drill Trousers. As always perfect and the best service in the business. As always perfect and the best service in the biz.